A State High Court sitting in Makurdi on Monday vacated the interim order which restrained the Speaker, Titus Uba; and 21 other members from sitting at the Assembly complex. The Chief Judge of the state, Justice Aondover Kaa’kan, vacated the order while ruling on a motion brought to it by counsels to the Speaker, Mr. Sebastine Hon (SAN) and Edward Ashiekaa (SAN). Messrs Hon and Ashiekaa had prayed the court to set aside the interim order of August, 13, 2018 which restricted the Speaker, Titus Uba, and 21 others from conducting business activities in the Assembly complex. Justice Theresa Igoche, who was ruling on the motion brought before her by Mike Osman (SAN), counsel to the impeached Speaker, Terkibir Ikyange, last August, had restrained the new Speaker and other 21 members from the Assembly complex. In his ruling, Justice Kaka’an stated that by law, the judicial arm of government cannot restrain the Benue State House of Assembly from performing its legislative functions. He stated that the role of the judiciary was not to overheat the polity with orders capable of destabilising same, maintaining that the court should not encourage impunity in any way. Justice Kaa’kan described the argument against the granting of the motion by counsel to the former Speaker, Terkibir Ikyange, and seven others, Mr. Sunday Okpale, as an academic exercise. He ruled that the interim order of August 13, 2018, which restrained the use of the Assembly complex, played on the intelligence of an earlier order and the entire legal system and was a dent on the image of the judiciary. Justice Kaka’an maintained that injunctive orders were not at the beck and call of the court to be shared and that claimant must earn them. The Chief Judge who adjourned the case to November 28, however, transferred the substantive case to Justice Augustine Ityonyiman of High Court 9 for hearing and determination on November 26th, 2018. 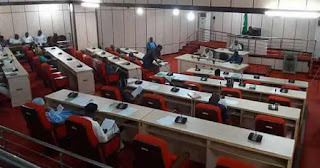 Attorney General and Commissioner for Justice, Mr. Micheal Gusa, stated that by virtue of Monday’s (today) ruling, the Benue State House of Assembly under the leadership of Uba can now conduct legislative business at the Assembly Complex. He said the ruling indicated the clear existence of separation of powers, as no arm of government can prevent another from carrying out its constitutional functions.